Wells-next-the-Sea TownBetween the epic expanse of sand of the world-renowned Holkham Beach and the precious bird sanctuary of Blakeney Point, lies the harbour town of Wells-next-the-Sea. Named (and recognised in the Domesday Book) for the fresh springs that once percolated up through the glacial chalk of this stretch of coast, the town is actually a mile inland nestling behind a stalwart bank of pines and an expanse of saltmarsh reclaimed for agriculture by the Holkham Estate in the 1800s. A narrow-gauge railway runs from the town to the beach, with its lively array of stilted beach huts, and visitor car park. 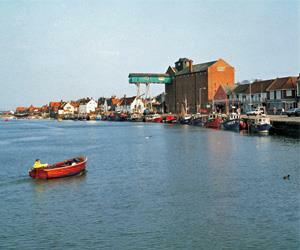 The harbour at Wells is overlooked by an imposing granary (dating from 1904), with its gantry stretching across the street to the quay. From the harbour, narrow lanes with chic shops, eateries and art galleries lead towards the Buttlands, a large town green surrounded by majestic lime trees and elegant Georgian houses, whose name suggests it may have been used for archery practice in the Middle Ages. Early in the 19th Century, the town of Wells was officially renamed "Wells-next-the-Sea" to distinguish it from other Wellses - a name that had to be re-adopted in 1956, because it had become known more by the name on the signs at the railway station: "Wells-on-Sea". Another narrow-gauge railway, the Wells and Walsingham Light Railway, uses part of the old Norwich line track bed on its way to the picturesque shrine village of Walsingham. This part of North Norfolk forms part of the largest coastal nature reserve in England and Wales, and Wells-next-the-Sea - and indeed the whole of the Norfolk Coast Area of Outstanding Natural Beauty - is a haven for twitchers. Bitterns and terns, oyster catchers, avocets and marsh harriers are among the species which make this part of North Norfolk a prime site for birdwatching. Between the epic expanse of sand of the world-renowned Holkham Beach and the precious bird sanctuary of Blakeney Point, lies the harbour town of Wells-next-the-Sea. Just a few miles along the coast is the Palladian seat of the Earls of Leicester, Holkham Hall, with its 3000-acre deer park and Bygones Museum.